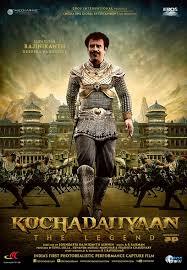 While a Rajinikanth film does not need any reason to work Kochadaiiyaan has more than enough reasons for it to not work. Indeed a must-watch for Rajnikanth’s fans! While a Rajinikanth film does not need any reason to work, Kochadaiiyaan has more than enough reasons for it to not work. The god, the phenomenon, the ultra magnificent, the ultimate Rajinikanth is back and Vow!!.. around fours years before 'Enthiran' (Robot in Hindi) the Thalaiva along with Shankar turned the heads of the west and now with 'Kochadaiiyaan' the super star blesses Indian cinemas motion capture animation as director Soundarya Rajinikanth adds dazzlingly spectacular pages in India's animation history. Easily one of the best soundtracks that A R Rahman has produced for the Superstar!